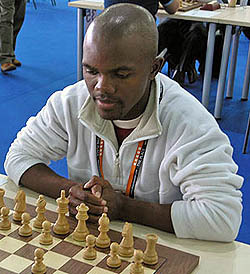 Kenneth Boikhutswane, "Njobvu Top of Botswana's Chess Rankings," Mmegi, 7 July 2006 (Gaborone, Botswana). Ignatius Njobvu has overtaken FIDE Master (FM) Phemelo Khetho as the highest rated chess player in the country. In the latest World Chess Federation (FIDE) rankings that became effective on July 1, Njobvu's rating has now gone up from 2235 to 2247 after the World body rated the nine games he played at the recent Turin Olympiad. This is a gain of 12 points from his previous 2235. FM Khetho gained only two points from the eight games rated at the same event. He is now rated 2240. Njobvu's return to the top as Botswana's number one player is not a surprise, given his recent good form at international events. 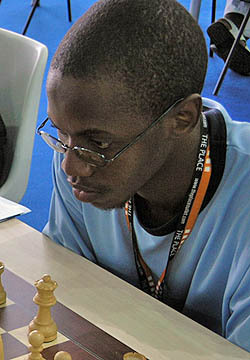 Njobvu played well at the Olympiad and was at one point on course to be titled after he amassed 3.5/4 points. Four losses in a row put an end to his dreams of getting a title that has somehow proved to be elusive for Botswana's tournament record holder. Njobvu started dominating way back in 1992 as a primary school pupil when he beat players much older than himself. Then he was simply unstoppable and won the senior school's championships as a 12-year-old. His run in the school's championships was broken only once in 1993 by Michael Modimakwane of Molefhi Secondary School. Except for this setback, Njobvu never looked back and was schools' champion until completing his Form five. That Njobvu won the Botswana National Championship as a pupil in 1996 speaks volume about his playing abilities, as at the time there were strong players in the likes of Nedjo Stevanovic, John Hutcheson, John Toscano, Mopati Jobe, to mention a few. He has been victorious at Botswana Open Championships, ahead of renowned players in International Masters (IM) Amon Simutowe and Robert Gwaze of Zambia and Zimbabwe respectively. That Njobvu is still not titled is something that is beyond the understanding of many looking at his impressive record. FM Khetho is sure to be pleased with the two points he has gained as he did not have a particularly impressive Olympiad by his standards. When things get rough, as was the case with Khetho in Italy, then a player is often happy with keeping his current rating as opposed to losing points. The FM has been dominant in the local chess scene for the past two years as evidenced by his back-to-back victories in the national championships. John Hutcheson is third in the rankings with a rating of 2200. Hutcheson has not played much chess in the past three years and looks to have gone into semi-retirement. Ofentse Molale, who could only score 2.5/5 points at the Olympiad has lost fourteen points and is fourth. Rated at 2210 before the Olympiad, Molale's rating has gone down to 2196. Tebogo Pitlagano in fifth place has made a huge gain from 2130 before the Olympiad to 2155. Barileng Gaealafshwe, who had a torrid Olympiad scoring just 1/7 points has lost 18 points and is now rated 2107. This puts him in eighth place in the country. Providence Oatlhotse and Olebogeng Hosiah are sixth and seventh in the list respectively. Their ratings are unchanged as they did not play any rated games. FM Phemelo Khetho in action at the 2006 Olympiad in Turin, Italy. Photo by Daaim Shabazz. Oatlhotse is rated 2154 with Hosiah at 2132. Baone Kealeboga and Moapti Jobe complete Botswana's top 10 with ratings of 2106 and 2098 respectively. Only two Botswana ladies are listed in the FIDE rankings. Woman Grandmaster Tuduetso Sabure is the highest ranked woman with a rating of 2067, and is placed 13th in the combined standings. WFM Boikhutso Mudongo is the other rated woman at 1962. It was widely expected that Moakofi Notha, Ontiretse Sabure and Keitumetse Mokgacha would get their FIDE ratings following their exploits at the Turin games in which they reached the 50 percent score. However, their omission from the list could mean that they may have to try for ratings in other events. Botswana is now ranked 109th in the World with a rating of 2164, a big fall from last year when the country was in the top 100. A total of 29 players are listed in the FIDE ratings, but only 18 are active.